The PuSh International Performing Arts Festival is Vancouver’s mid-winter festival featuring acclaimed local, national and international artists. 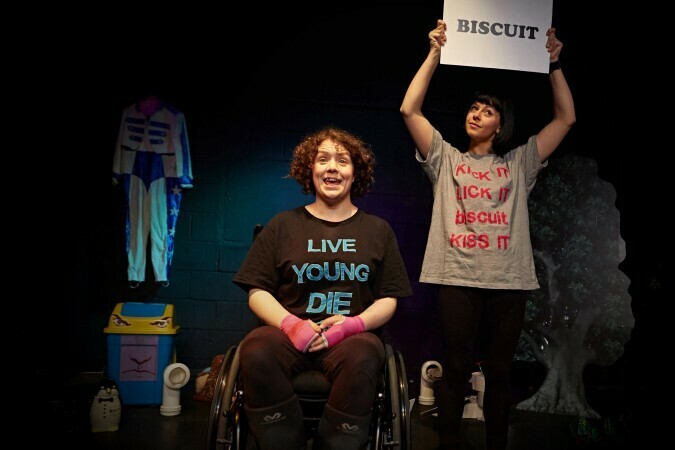 We strive to make the festival accessible to all and this year we are expanding that accessibility with relaxed performances for the performances of Backstage in Biscuitland. Biscuit, biscuit, biscuit: Jess Thom just can’t stop saying the word. As a woman with Tourette syndrome, she has verbal and physical tics that make her incapable of staying on script, but that hasn’t stoppedher from becoming a powerful writer and performer—quite the opposite, in fact. Her show uses comedy, puppetry and song to bring her world to audiences. Thom loved the theatre as a child, but the intensity of her tics made it increasingly difficult to attend, a situation that culminated three years ago when she was asked to sit in isolation during a performance. Instead of never returning to the theatre, Thom found the only seat in the house she wouldn’t be asked to leave: the stage. A visual story with information and picture about the venue and the play as well as a full break down of the story is available on the website. This entry was posted on January 31, 2017 by Events Manager.